Lightstream is a generative artwork that registers the ebb and flow of its surroundings with cascading patterns of ever-changing light. It is a playful composition slowly evolving over time, revealing the latent dynamics of its site. 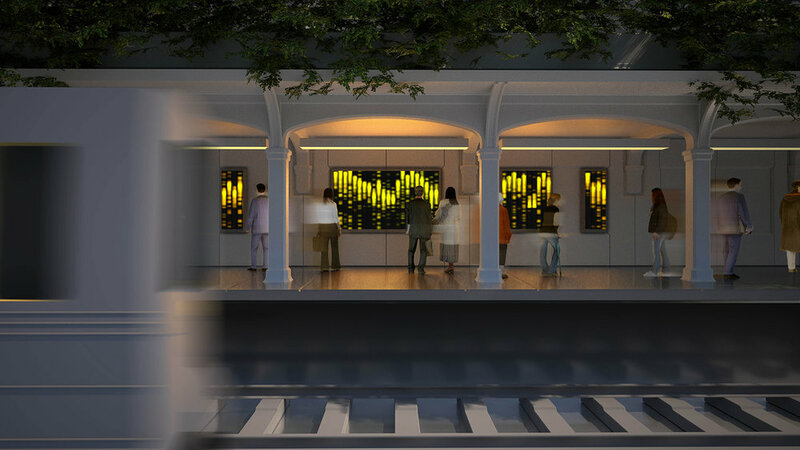 Defined by shadow, light, and human interaction, the wall-mounted artwork captures both the real-time and recorded information of MTA ridership on the N Line. Patterns are disrupted as one passes in front of the installation, deforming the pattern and casting a ‘shadow’ on the data represented. The individual rider leaves an imprint on the larger system of information by transforming the artwork, albeit temporarily. Lightstream is custom fabricated using waterproof LEDs behind vandal-proof channel glass. Subtle changes have the ability to create dramatic visual effects—smooth and turbulent topographies that vary as one moves across the platform. Lightstream transforms everyday interactions into a kind of artificial nature, creating an ever changing landscape one can visually inhabit, experience and participate in. Whether a regular commuter, a visitor on the train heading to Coney Island, or a fellow traveler waiting on the adjacent platform, Lighstream creates a dynamic surface to view and interact with while traveling to the beach or the city.